Lazio region is located in central Italy and is the heart of the Roman Empire, which, over the centuries, has forged the natural and artistic landscape. This region has different yet complementary features, unblemished sceneries and spectacular horizons among the towns. Visiting Rome the sensation is like stepping back in time, a unique emotion that accompanies every single moment spent in the Eternal City. 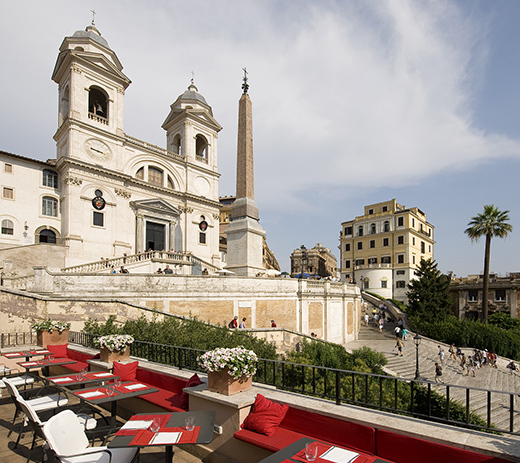 From the rooftop terrace of Castel Sant’Angelo it is possible to enjoy a spectacular 360-degree view of the city: the roofs of houses, a palette of pastel colors that meets the blue sky, the Altare della Patria, the domes of the churches, first of all St. Peter, with its colonnade. Walking through the streets of Rome you will discover countless wonders, testimonies of the Roman Empire that made this city great, first of all the Colosseum, the Imperial Forum and the beautiful Piazza di Spagna and the Spanish Steps. In Villa Borghese, the most famous city park in Rome, it is possible to live a unique experience, walking between art masterpieces and nature. Lazio is also well know for its spas, whose history is bound to the several thermal water springs. The Romans built luxuriant thermal baths like the Terme di Caracalla (now in a state of magnificent ruins) in Rome. Leaving Rome it is possible to discover beautiful ancient residences, like Villa D’Este, with its splendid fountains and gardens and Villa Adriana, both UNESCO World Heritage, situated in Tivoli. For nature lovers, this region, bordered by the Tyrrhenian Sea, offers different beaches as Gaeta, Sabaudia, Sperlonga and the Islands of Ponza and Ventotene. As an alternative there is Bracciano Lake, encircled by nature and overlooked Odescalchi Castle. For mountains lovers this region offers also different ski resorts, like Terminillo, Livata and Campo Staffi. The regional cooking tradition combines strong and intense flavours with simple and genuine dishes. First dishes include gnocchi, spaghetti all’Amatriciana, spaghetti alla Carbonara, oxtail Vaccinara style, saltimbocca alla romana and porchetta (roasted pork). Also vegetables are very popular in this region, above all Roman artichokes and the olives of Gaeta. All those specialities can be matched with wines produced in this region, like the Aleatico di Gradoli, the wines of the Castelli Romani and of the Albani Hills. Visiting Rome the sensation is like stepping back in time, a unique emotion that accompanies every single moment spent in the Eternal City. From the rooftop terrace of Castel Sant’Angelo it is possible to enjoy a spectacular 360-degree view of the city: the roofs of houses, a palette of pastel colors that meets the blue sky, the Altare della Patria, the domes of the churches, first of all St. Peter, with its colonnade. Walking through the streets of Rome you will discover countless wonders, testimonies of the Roman Empire that made this city great, first of all the Colosseum, the Imperial Forum and the beautiful Piazza di Spagna and the Spanish Steps. In Villa Borghese, the most famous city park in Rome, it is possible to live a unique experience, walking between art masterpieces and nature. Lazio is also well know for its spas, whose history is bound to the several thermal water springs. The Romans built luxuriant thermal baths like the Terme di Caracalla (now in a state of magnificent ruins) in Rome.